We could have gone out to the shops and bought them. But where is the fun in that? I think something I found online might help to explain. True in 1974 and true now. 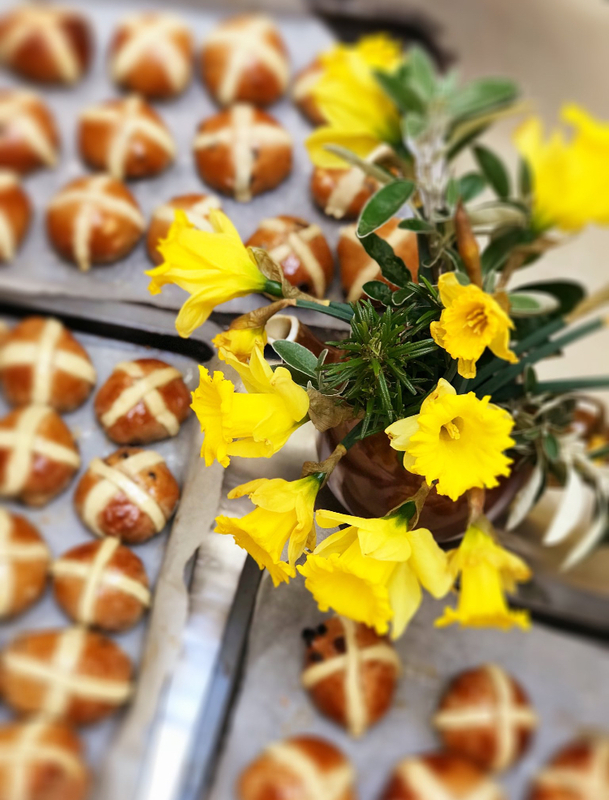 Below is the research I carried out to give the Hot Cross Bun course! I started with Jane Grigson’s recipe in “English Food”, they were delicious. Indeed so delicious that I photographed them to promote the course. Put flour and salt into a large warmed mixing bowl. Crumble the yeast into a pudding basin, add 1 heaped spoonful of the sugar and 125g (4oz) of flour from the bowl. Pour the milk into a measuring jug, and make up the 250ml (8oz) of liquid with boiling water straight from the kettle. With a wooden spoon mix this hot liquid into the yeast, flour and sugar – go slowly so as to make as smooth a batter as possible: leave it in a warm place to rise and froth up – this takes about 15 minutes, or a little longer. Meanwhile mix the rest of the sugar with the flour, and rub in the butter. Form a well in the centre, put in the egg and the frothy yeast mixture. Mix to a dough with a wooden spoon. Turn it out onto a floury surface and knead for 10 minutes, adding more flour as required, until the dough is a coherent, slightly rubbery ball, with a moderately tacky, but not sticky texture. Any dough on your fingers should rub off easily. Wash, dry and grease the large mixing bowl with a piece of butter paper. Place the dough in it. Cover with a damp cloth, or put the whole thing inside an oiled polythene bag. Leave to rise to double its quantity. This can take anything from 1 to 12 hours dependent on the temperature. Break down the risen dough, knead in the fruit and the peel. Roll the dough into a long sausage shape on a floured surface, and cut it down into 18 discs. 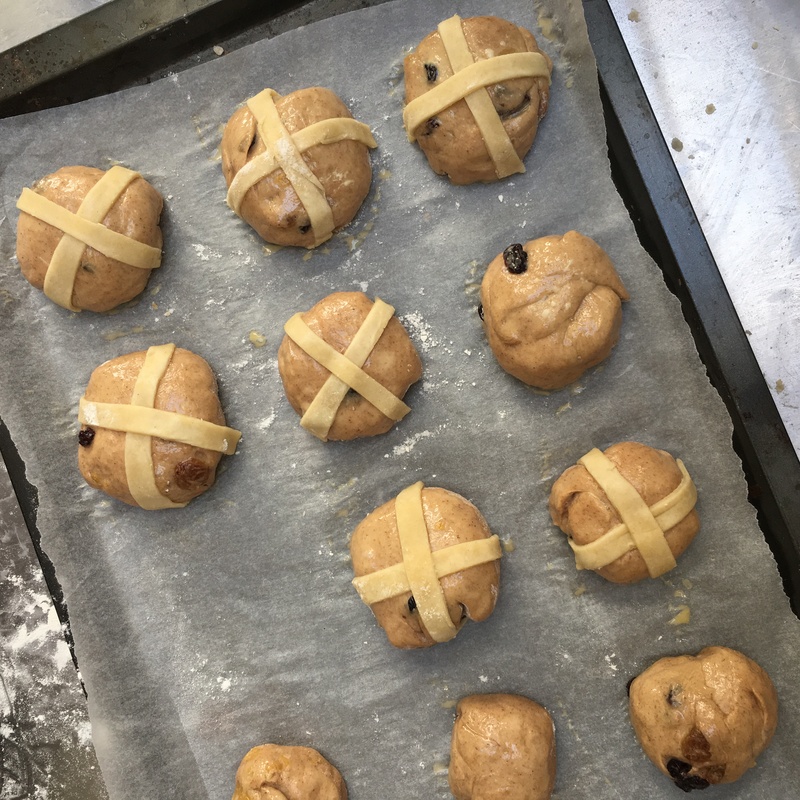 Shape them into round buns, and then place them on baking sheets lined with Bakewell paper – leave them plenty of room to rise and spread in the baking. Roll out the almond paste or shortcrust pastry and cut into thin strips. Brush the buns with beaten egg and lay 2 strips on each bun to form a cross. Leave the buns to prove about 30 minutes; then bake them for 10-15 minutes at mark 8, 230 degrees (450 F). Boil bun wash sugar and water together until syrupy. 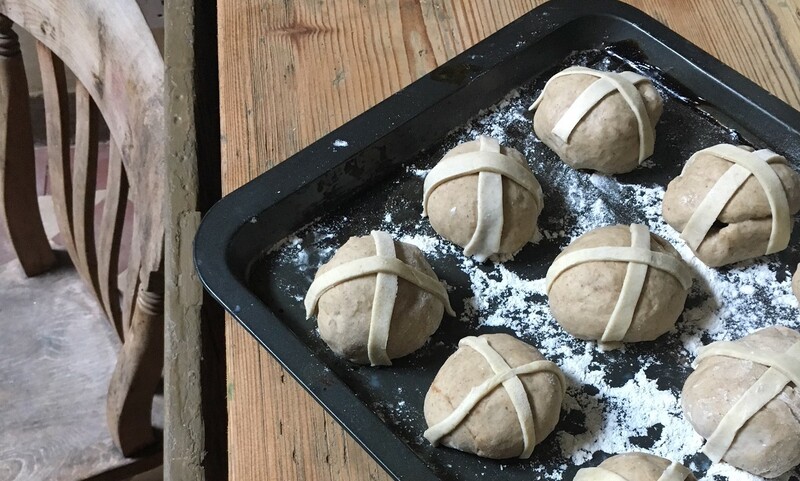 Brush this over the hot cross buns as they come out of the oven. Leave to cool. But this wasn’t enough. I wanted to go authentic. 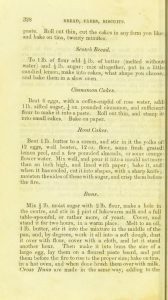 I had been chatting on the Regency Town House’s Facebook page and there was a real demand for a proper authentic recipe. I was, after all, holding the course in an historic kitchen. I decided to go online and find a recipe from a time that the Regency Town House was in its prime as a prestigious family residence. There is a wonderful resource called the Wellcome Library. 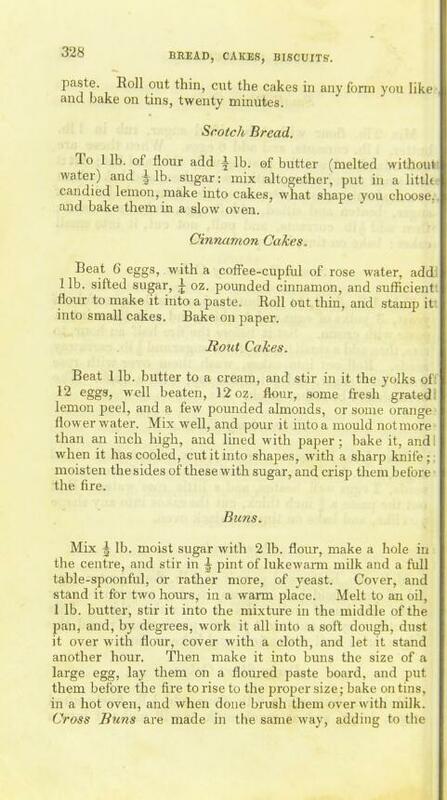 I found reference to it in Mary-Anne Boerman’s book “Great British Bakes”. 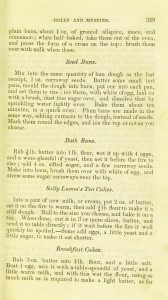 The Wellcome Library allows online access to historic cookbooks and here you can discover recipes in their original form. I strongly recommend it. 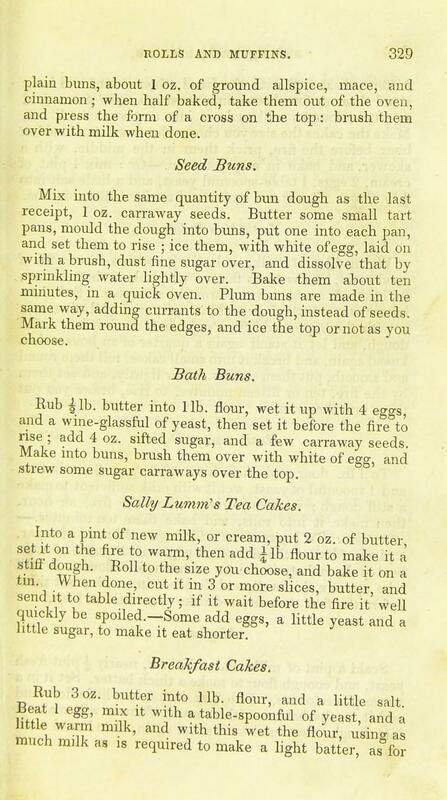 I discovered this recipe, mentioning Hot Cross Buns, from 1831. I worked out that wet sugar was dark brown sugar, moist sugar was light brown sugar. I made the recipe in total 3 times. It had to be done, from start to finish in 3,5 hours, the length of the course. Every time I made it the buns didn’t rise enough. I suspected the butter made the dough too dense. I think they needed to be proved for longer, longer than I had calculated for the course. They were delicious. I knew that the large quantity of spice was a winner. Jane Grigson is not as bold as the cook in this earlier recipe. If you want to make them please try. I think that the proving times just need to be a lot longer. My suspicion is that the relatively large amount of butter slows down the yeast. If you succeed with this recipe I’d love to know. The next place I looked was back to Mary-Anne Boermans. 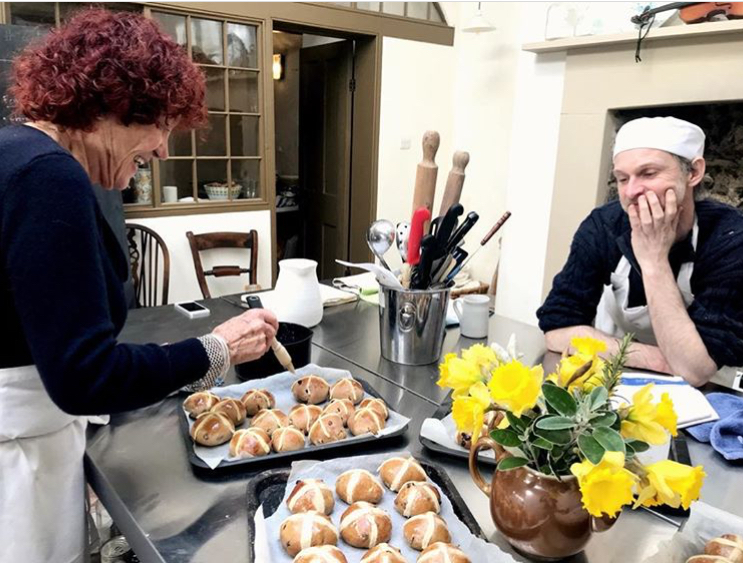 In her book “Great British Bakes” she had a wonderful recipe for Hot Cross Buns. She argued that bakers would often simply adapt a bun recipe to make it into a Hot Cross Bun recipe. After all buns were not available all year round, as they are now, and it would make sense to adapt a bun that was already being baked. Here is the final recipe. This is the recipe that I tested and tested. Warm your mixing bowl by swirling with hot water then drying it. Add the flour, yeast, spices, pepper and salt. Cut butter into tiny cubes and add to the dry ingredients. Rub with your fingers until the butter is incorporated and the mixture resembles breadcrumbs. Add the egg. Put 75ml boiling water into a measuring jug and add milk to make 150ml of liquid. Add this lukewarm liquid to the bowl. Using a spoon mix until the mixture comes together. Sprinkle flour onto your work surface and tip the soft dough out. Knead for 10 minutes. Cover the dough with cling film or a clean tea towel and leave for an hour somewhere warm for an hour, it should have doubled in size, if it hasn’t leave until it does. Turn out the dough onto your work surface. Add the fruit and the peel. As you knead in the fruit, the dough will reduce down in size, this is normal. Return to the bowl and let the dough prove again for another hour. Divide your dough into pieces of about 50-60g. I tend to do this with scales. 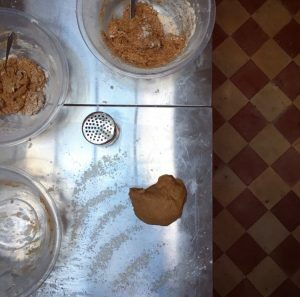 If you don’t mind different shapes and are inpatient a quick way is to simply divide the dough into roughly equal pieces. Put the buns into your tin, leaving space between to allow them to expand. Make a simple pastry. Roll out the pastry and cut into thin strips. Beat up an egg and brush onto the buns with a pastry bush. This will help the pastry stick to the buns and give a dark brown colour when baked. Form pastry crosses on the buns. These buns will now have a third rise. This time for 30 minutes. This is a good time, if you are doing the course at the Town House, to explore the basement and see the small, dark pastry room. Just imagine having to make your buns there! After 30 minutes the buns can be baked. 18-20 minutes 180oc/gas 4. When ready lift one of the bun and tap it’s bottom, close to your ear, it should sound hollow. If not give it a minute or so longer and test again until ready. While the buns are baking put the sugar into the water and heat gently until the sugar is dissolved. Using a pastry brush cover the buns (while still hot) with the bun glaze. Let the buns rest for 10 minutes then you can eat. The volunteers upstairs got used to the smell of baking hot cross buns that whafted round the Town House. We made biscuits on the course while we were waiting for the dough to rise. In addition I gave guided tours of the Town House so the participants could see round the Town House, for many it was the first time that they had visited.